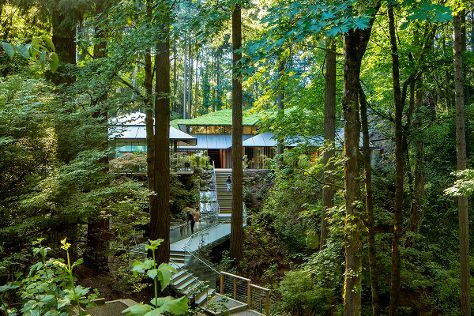 Visiting Multnomah Falls and Sokol Blosser Winery will get you outdoors. Get some cultural insight at Evergreen Aviation & Space Museum and Carlton Winemakers Studio. There's still lots to do: contemplate the long history of Pittock Mansion, look for gifts at Powell's City of Books, examine the collection at Oregon Museum of Science and Industry, and admire the natural beauty at International Rose Test Garden. For other places to visit, reviews, maps, and more tourist information, refer to the Portland tour itinerary planner. Chicago to Portland is an approximately 7-hour flight. You can also do a combination of train and flight; or drive. The time zone changes from Central Standard Time (CST) to Pacific Standard Time (PST), which is usually a -2 hour difference. Plan for a bit cooler nights when traveling from Chicago in June since evenings lows in Portland dip to 56°F. 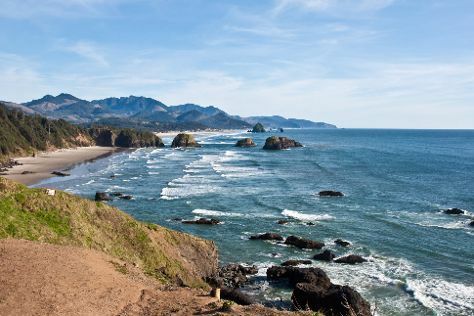 Wrap up your sightseeing on the 25th (Tue) to allow time to drive to Cannon Beach. Cannon Beach is a city in Clatsop County, Oregon, United States. Do some cultural sightseeing at Fort Clatsop National Memorial and Columbia River Maritime Museum. Visiting Haystack Rock and Ecola State Park will get you outdoors. Change things up with a short trip to Astoria Column in Astoria (about 42 minutes away). There's lots more to do: tour the pleasant surroundings at Cannon Beach, stop by Bronze Coast Gallery, and enjoy the sea views from Tillamook Rock Light. For where to stay, other places to visit, photos, and more tourist information, read our Cannon Beach trip itinerary planner . You can drive from Portland to Cannon Beach in 2 hours. Another option is to take a bus. While traveling from Portland, expect little chillier days and about the same nights in Cannon Beach, ranging from highs of 66°F to lows of 52°F. Wrap up your sightseeing on the 28th (Fri) early enough to drive to Hood River. The city of Hood River is the seat of Hood River County, Oregon, United States. 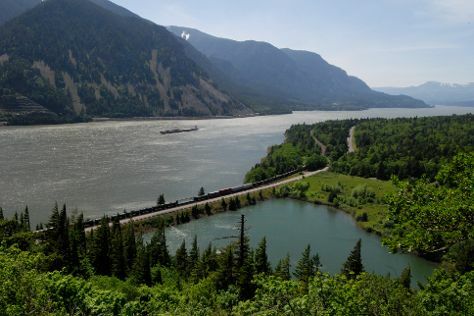 On the 29th (Sat), relax in the rural setting at Hood River Lavender, then see the interesting displays at Western Antique Aeroplane & Automobile Museum, and then contemplate the waterfront views at Columbia River Gorge National Scenic Area. To see reviews, ratings, maps, and more tourist information, read Hood River holiday planner. Getting from Cannon Beach to Hood River by car takes about 3 hours. Other options: take a bus; or do a combination of bus and train. Traveling from Cannon Beach in June, you will find days in Hood River are a bit warmer (72°F), and nights are about the same (55°F). On the 30th (Sun), wrap the sightseeing up by early afternoon so you can travel back home.